I think one of the unsung benefits of knitting is that it helps you practice decision-making skills. Most of the day in our non-knitting lives we have to make a lot of decisions, often very quickly, many of which we don’t actually have a personal interest in. But when you sit down to choose your next sweater you have to make about a bazillion choices (or, at the very least, two or three) right off the top: Which pattern? Which yarn? Which size? Should I swatch? Should I modify it? Should I make it for a special occasion? What if it doesn’t turn out, then what will I do with it? All this is just my way of saying at the moment I am deciding between two sweaters for my Next Sweater: Bonnie, and the Climbing Vines Pullover (holla, Winter 2008 IK). I’m delaying this decision because, well, the anticipation is actually sort of enjoyable. There is no pressure in either direction and I’ve got the yarn for both. I’ve even swatched for both, take that knitting fates! The dark purple Mission Falls 1824 wool is part of my stash that’s been there for a year now, thanks to a sale last winter. I went looking for ideas on what to do with it and that’s when I found Bonnie. I love how deep and dark it is, and even on a sweater with a lot of cables, I think it would do fine. And Fiona Ellis does know her way around some Mission Falls, and (HAH!) my gauge is perfect. As for the Climbing Vines Pullover, I admittedly hadn’t even considered it until I went browsing on Ravelry and saw all the nice dark and mottled versions of it. I think what made it escape my notice in the magazine was quite simply the sample colour, so pale and washed out. But in the blue lagoon Dream in Color Classy? And only 5 skeins for a sweater? Yes please. In the end, it may all come down to which one my brain chooses tonight when I get home and sack out. Further bulletins as events occur, so stay tuned. 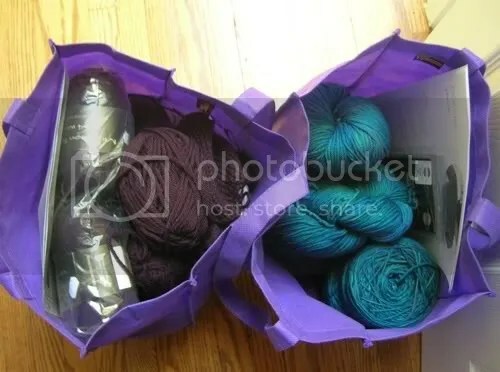 I’d have a hard time making a decision too – I love both of those yarn/pattern combinations you’ve picked. There’s nothing more fun than the planning, is there? First, I love the way the blooming cardigan turned out! I don’t do bobbles often, but I’m really tempted by that pattern! For what it’s worth, I say go for the Climbing Vines – that blue lagoon color is gorgeous, and it is a change from the purple colors you tend to choose. I have to say, one of the things I don’t like about living in Texas is that we are already getting 80 and even 90 degree weather, which makes even finishing the Aran cardie I’m making difficult. Who wants all that wool on the lap when it’s this warm! At least I know lots of people having babies, giving me lots of little projects to do – currently the “little sister’s dress” by knittingalot. Great pattern and a new way to use some of the sock yarn stash! so funny… I’ve been swatching with the DIC Blue Lagoon, trying to decide what to do with it! I think that Bonnie, as shown on the Twist Collective page, is sloppy looking. It looks too big on the model. Would you make it more fitted? Because the design itself is nice — the cables are very cool. I think my problem with the climbing vines pullover is the way it’s all loose and frumpy on that model in IK. It looks better a bit more fitted, I think. And not that you asked for opinions 🙂 but that would be my vote on the next sweater. It would go more quickly than Bonnie and you could wear it in spring! Both patterns are great! But I’m loving all the Climbing Vines Pullover loads and loads. 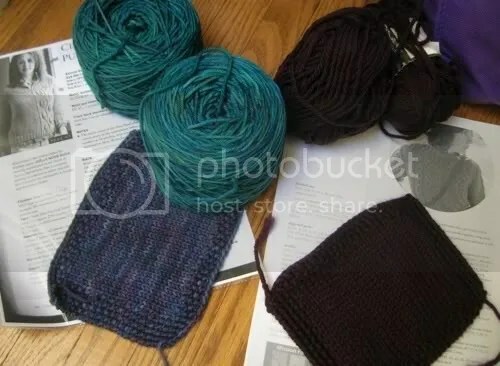 I agree about the washed out look of the photos in Interweave Knits. I don’t know if you’ve worked with Mission Falls before but it grows something fierce once washed and worn. I’d abuse your swatch a bit to make sure that you definitely do have gauge. I’ve been eyeing the climbing vines pullover myself actually. I’m thinking you’d probably want to lengthen it though. Both yarns looks like they’ll be fun to work with. They both look promising indeed! Have fun! I’m so glad I discovered your blog! I also knit sweaters, and I always feel that deciding what to knit next is half the fun! I recently started a blog, also (http://cheerfulknitter.blogspot.com). It cuts into my knitting time, but has been very rewarding in other ways. I’m looking forward to following yours. Good luck! I wasn’t drawn to the Climbing Vines pattern either because I didn’t like the pastel color they used for the sample. But then I saw it on Ravelry in DIC Classy – Chinatown Apple. It looked gorgeous and I happened to buy the yarn at Stitches West last weekend. I think it’s going to be my next sweater. I like Bonnie too. Tough decision!